At the August 1 City Council meeting, the Rancho Cordova City Council presented checks to five local organizations who received grants from the City’s Community Enhancement Fund. 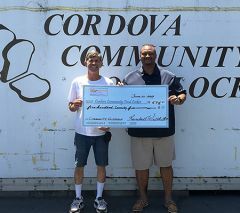 The Cordova Community Food Locker received a grant for $40,784.87 to purchase this new box truck! The truck will be used to collect and deliver emergency food supplies to the hungry, including families and children, in the City of Rancho Cordova. Pictured left to right: Council Member Robert McGarvey, Deacon Walter J. Little, Council Member Dan Skoglund, Vice Mayor Donald Terry, Council Member Linda Budge, and Gary Greeson. Yep, this can be a fun, and entertaining evening for you and your significant other, or possibly a chance just to get to know someone better. This is also a great idea for a group that would like to have shared time with hands on experience or just a bonding time with your daughter-in-law. The House of Gekkeikan Sake offers an exotic opportunity to share in the world of Sake along with a Sushi making class every other month at the brewery in Folsom. The tasting room is all set up with all the tools you need, except you must bring a sharp knife. A welcome is extended by the tasting room representative with an invitation to take part in a buffet before beginning. It begins with an appetizer of Mango Tequila Sauce over cream cheese and crackers, Caesar Salad, Pineapple Sake Teriyaki meatballs, Meyers Lemon Rosemary sausages and cookies for dessert. Their sauce source is the excellent products from Earth & Vine*. The first tasting of Sake begins with the award winning Black & Gold, but this can depend on the weather. My class was in March so this was served warm, but in the summer months they follow the Japanese tradition serving cold Sake which is more fruity in nature. Our teacher is Chef Metha of Kanpai Sushi Restaurant. 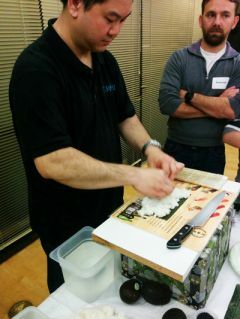 He begins by telling us exactly how to hold the rice and place it on the Nori seaweed sheets. We are split into small groups and receive instruction on creating the perfect California Roll using the correct technique including the moistening of our fingers for working the rice. We return to our seats and have the all the ingredients to make our first roll, which is a practice run, preparing us for the Sushi competition later. While other class members are receiving their instruction we sample Haiku a light medium dry wine that is served chilled and then Suzaku, considered premium sake. At this point I have made my practice California Roll and ate most of it while enjoying the tastings. We now enter the competition phase and have an opportunity to show off our skill. I am feeling pretty confident and make the second roll along with a pour of Zipang, a sparkling sake. This is bright and light which would complement a wide array of appetizers. However, my beautiful rolls plated with a ginger flower and slivers of cucumber did not even figure into the final two. There was lots of laughter with winners declared for both gals and guys. Our second lesson was a hand roll. Right up front, this technique was beyond my capabilities, but others seemed capable. Again we could practice and then have a second chance with winners receiving prizes. We finished our tasting with two plum wines Kobai, light and sweet, with a suggestion to be paired with blue cheese and Plum Gekkeikan, which was very good. Raffle drawings for great prizes completed the lesson. It really was a very enjoyable and educational evening with wonderful hosts. The class cost was $35.00. With my new rice cooker, I have made sushi twice at home, but certainly have to practice a bit more. *Earth & Vine story in April Gold River Messenger. Alona’s hobbies are food and delicious times. alonathomas@gmail.com. Rancho Cordovan Randall Wilhite knows a thing or two about his hometown and what makes it tick. One of those things is the Cordova Community Food Locker. Operating from St. John Vianney Catholic Church, the Food Locker works hard year round to distribute its goods to those who otherwise would go hungry. Wilhite recently put together a charity event to benefit the Food Locker, resulting in donations of nearly $600. The first annual “BBQ & Brews” free event featured products from local businesses, grocers, breweries and more. Wilhite and his brother Gerald even participated in a friendly competitive barbeque cook-off. A diplomatic tie resulted, with Gerald receiving honors for best cooking and Randall snagging kudos for his homemade family recipe barbeque sauce. The Wilhite family has been a local institution for decades, well known for producing stellar athletes who played in local sports such as baseball, football and track before going on to play for colleges and even professional teams, but they have remained true to their Rancho Cordova roots. Wilhite credits his mother, Gene, a long-time Rancho resident for his upbringing and nurturing his strong family ties and desire to do good works. Now a veteran professional events planner, Wilhite makes sure he incorporates charitable actions into his events in order to give back to the community. 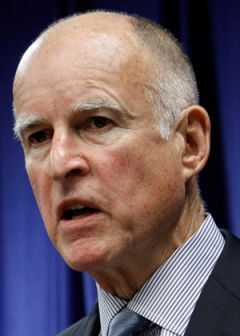 He already is at work on upcoming events such as the Rancho Cordova Taste Festival. “This is about culinary diversity,” said Wilhite. “It’s about showcasing what’s in the City.” Area chefs from food trucks to restaurants will be offering samples of their best products. The event will feature appearances by local personalities, live music and more. Admission to the public is free and taste tickets will be available for purchase. 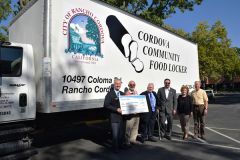 As for the funds raised for the Cordova Community Food Locker, they will likely go toward meeting the group’s holiday giveaway, a period of great local demand. To make or receive donations, contact them directly at (916) 364-8973. For information on attending or participating in the June 3 Rancho Cordova Taste Festival, contact Randall Wilhite at (916) 765-5299 or randallwilhite@yahoo.com. (NewsUSA) - Sponsored News - Only nine percent of Americans are meeting their daily recommended consumption of vegetables, according to the Centers for Disease Control and Prevention. This May, National Salad Month, make an extra effort to get your greens and meet the 2016 USDA Dietary Guidelines, which recommend that you consume between two and three cups of vegetables per day. While this may sound like an impossible feat, it’s easy enough to accomplish with one simple dish, a salad. Not only can you make a dent in your daily consumption of vegetables, but you can also work your way towards achieving some of the other USDA Dietary Guidelines recommendations. Add meats such as steak or chicken and nuts such as pecans, walnuts and almonds to get a protein boost. It is recommended that an adult get anywhere from five to six-and-a-half ounces of lean and varied proteins per day. Add fruits such as oranges or strawberries to try and hit the two cups of recommended fruit serving per day. Crackers or quinoa can help you reach your allotment of three to four ounces of grains, half of which should be whole grains per day. A little cheese can go a long way in helping you to meet the three recommended cups of dairy per day. Salad dressings count towards the five to seven teaspoons of oils that you should be consuming each day and the oils in dressings, such as canola and soybean, help your body to absorb nutrients from vegetables. Salads provide a healthy and easy avenue to gather several of the recommended nutrients. Here’s a simple recipe for Baby Greens with Roasted Pears, Feta and Walnuts to show you how easy it is to make a healthy and delicious salad. 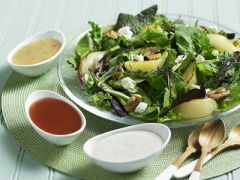 All you need are pears, olive oil, baby greens, feta cheese, toasted walnuts, salt, pepper and your choice of salad dressings. First, preheat your oven to 400 degrees Fahrenheit. Line a baking sheet with wax paper and drizzle four pears, peeled, cored and cut into eighths, with one teaspoon of olive oil. Roast in the oven until the edges turn golden brown. Once the pears have cooled, toss with eight cups of baby greens and your choice of salad dressings (champagne vinaigrette is one recommendation). Sprinkle half-a-cup of feta and half-a-cup of walnuts over the greens, and season with salt and pepper. Now you’re ready to start enjoying National Salad Month like a pro! For more recipes and ideas, visit The Association for Dressings and Sauces at www.dressings-sauces.org.